1947-2013 In 1982, Florencio Campomanes (1927-2010) was elected to the FIDE presidency. In 1982, John Grefe (1947-2013) won the California State championship. In 1982, Garry Kasparov won the Chess Oscar for the first time. In 1982, there was no U.S. chess championship due to lack of funds. In 1982, Joel Benjamin and Vitaly Zaltsman tied for 1st in the Manhattan Chess Club championship. In 1982, Leslie Braun (1936-1998) won the Marshall Chess Club championship. In 1982, Larry Evans tied for 1st place with John Curdo in the U.S. Senior Open championship. 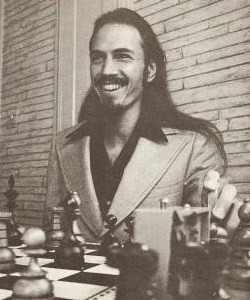 In 1982, Bill Wall published his first chess book, 300 King's Gambit Miniatures, published by Bob Dudley and Chess Enterprises. In 1982, it was the 1st time that an American beat a reigning world champ - Seirawan defeated Karpov. In 1982, the Israel Chess Championship was stopped in the middle of the tournament as several of its participants were called up for army service in Lebanon. It was later won by Yehuda Gruenfeld. In 1982, Lev Aronin, Lev died. He was awarded the IM title in 1950. He was Moscow champion in 1965. In 1982, Ken Thompson (1943- ) traveled to Moscow for a computer chess tournament and thought his computer, BELLE (PDP-11/23), was traveling with him on the airplane in a crate. However, the U.S. Customs Service confiscated the chess computer at Kennedy Airport as part of Operation Exodus, a program to prevent illegal export of high technology items to the Soviets. It took over a month and a $600 fine to retrieve BELLE from customs. Thompson later said that the only way the BELLE would be a military threat if it was dropped from an airplane on the head of some government official. In 1982, the 1st world under-20 championship for women was held. In January 1982, the first issue of Chess Notes by Edward Winter was published. On January 2, 1982 Johan Barendregt died in Gravenhage, Netherlands. He was awarded the IM title in 1962. He was a professor of psychology. On January 25, 1982, UK master Ian Duncan Wells (1964-1982) drowned in Rio de Janeiro. The day after he finished an international junior tournament in Brazil, Wells, 17, went swimming with a group of players at the famous Copacabana beach and got caught in an undertow. Rescued by lifeguards, he never regained consciousness and died after six days in a coma. On January 30, 1982 Mali issued two stamps to commemorate the 150th anniversary of Lewis Carroll. The stamps had a chess board in the background with Lewis Carroll and Alice in Wonderland. On February 3, 1982, Paulino Frydman (1905-1982) died in Buenos Aires. He was awarded the IM title in 1955. He was Warsaw champion in 1931, 1932, 1933, and 1936. On March 13, 1982, William Fairhurst died in Howick, New Zealand. He was British champion in 1937. He won the Scottish championship 11 times. On April 2, 1982, Richard Coles died in West Clandon, England. He was the author of several chess biographies. In April 1982, Walter Browne and Ron Henley tied in 1st Lady International in Surakarta and Denspasar, Indonesia. On April 8, 1982 Djibouti issued two chess stamps to commemorate the World Championship match in Merano. On April 14, 1982 Gibraltar issued a stamp called HMS Rooke with a picture of a rook. On April 16, 1982, British-American chess composer Joseph Edmund Peckover (1896-1982) died. On May 1, 1982 Libya issued several chess stamps to commemorate the World Championship match in Moscow. On May 2, 1982, GM (1999) Lazaro Bruzon Batista was born in Cuba. On May 21, 1982, Alexander Herbstmann, IM for chess compositions, died in Taby, Sweden. IJComp 1956; IMComp 1959. On May 26, 1982m Hermann Albrecht died in Frankfurt, Germany. IJComp 1957. On June 9, 1982 Guinea-Bissau issued a chess stamp to commemorate the 75th anniversary of scouting. It depicted scouts playing chess. In July 1982, Garry Kasparov, after winning the Bugojno International Tournament, was ranked No. 2 in the world. On July 5, 1982, Charles Stanley Hunter (1922-1982) died in Horley, England. He was British correspondence champion in 1961. In September 1982, Garry Kasparov won the Interzonal Tournament is Moscow, scoring 10-3, and qualified as a Candidate. At the age of 19, he became the youngest Candidate for the World Championship since Bobby Fischer, who was 15, when he qualified in 1958. In September 1982, Boris Gulko and his wife were arrested for protesting at the Moscow Interzonal in Moscow. They were trying to emigrate to Israel. Gulko was beaten by KGB agents and was forbidden to play in top-level competitions. In September, 1982, Air Force Sergeant Timothy Brown won the 23rd US Armed Forces championship. Air Force won the team championship. The event was held in Washington, DC. On September 6, 1982 the USSR issued a chess stamp to commemorate the World Championship match in Moscow. On September 22, 1982 the USSR issued a chess stamp to commemorate the World Championship match in Moscow, celebrating Karpov's victory. On October 6, 1982, GM Levon Aronian was born in Armenia. On October 21, 1982, Edmund Edmondson (1920-1982) died in Honolulu, Hawaii while playing chess at the beach. He was elected USCF President in 1963. He was USCF executive director in 1967. From October 29 to November 16, 1982, the 25th Chess Olympiad was held in Lucerne, Switzerland. The youngest chess player of the Olympiad was Kien Tjing-Joe, age 12, who played for Surinam. The Ugandan chess team showed up at Lugano, Switzerland, instead of Lucerne. The 1968 Chess Olympiad was held in Lugano. The Italian Chess Federation refused to have its best player, Stefano Tatai, to play on the Italian Olympiad team. Tatai was 44 and seven-time national champion. But the Italian Chess Federation only wanted members who were age 30 or younger to represent Italy. The result was a very poor showing at the Olympiad. The oldest player was Ron Blow of Guernsey, age 74. The $1.25 million budget for the event was raided by a lottery and private sponsors. In December 1982, the first electronic chess game on a complete bulletin board as played. On December 24, 1982 Chad issued 7 chess stamps depicting Philidor, Morphy, Staunton, Capablanca, Spassky, and Karpov. On December 29, 1982 Cuba issued 4 chess stamps commemorating the 40th anniversary of Capablanca's death.